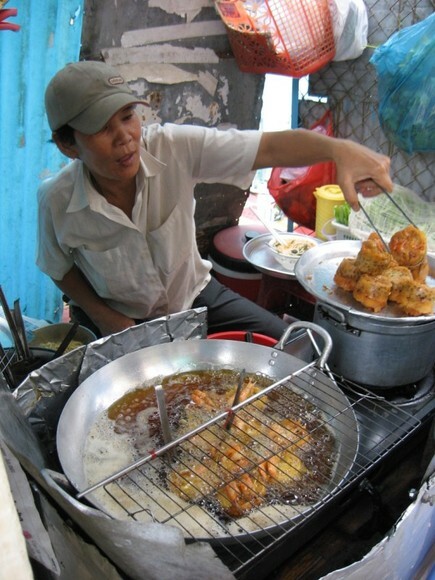 At first glance, I thought the lady was frying up some bánh tôm tây hồ—battered and deep fried julianned sweet potatoes with shrimp. Upon closer inspection, I came to realize I did not recognize what was bubbling away in her oil-filled wok. It is truly a red letter day in Saigon when I stumble upon a food that I have not heard of or tried before, and my encounter with bánh cóng on Vuon Chuoi Street (toward Dien Bien Phu Street) in District 3 was no different. 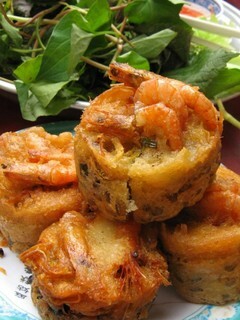 A close-relative of bánh tôm tây hồ and a distant cousin of bánh xèo, bánh cóng is golden in color and muffin-esque in shape due to the unique ladle-like mold it is assembled and fried in. 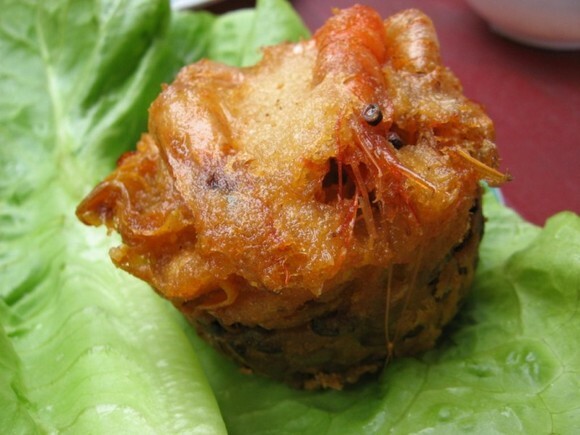 Bánh cóng is comprised of mung beans, shredded taro root and shrimps with their heads, tails and skin intact. 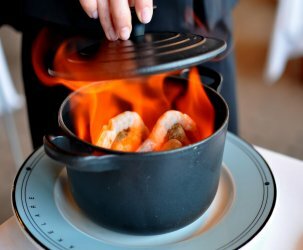 Each ingredient is layered in the deep, metal ladle and dipped in a saffron and scallion batter before meeting the scalding hot oil. After just a few quick minutes in the intense heat, the bánh cóng are freed from their moldings to develop a crispy exterior solo. The cakes are served piping hot with a heaping pile of fresh greens and herbs and the classic nuoc mam sauce. What I find most special about bánh cóng are the layers of taro and mung beans that comprise the cake’s base. These two ingredients brown beautifully and create a substantial and dense cake that is satisfying in a way that only carbohydrates can be. The greens and herbs delicately mask the cake’s oiliness, while the nuoc mam sauce ties all the flavors together like a champ. I am both charmed and kind of freaked out that you can see the shrimp’s little eyes peeking through that cake. I never could get used to food with faces… I love the sound of everything else that comes with these, though. 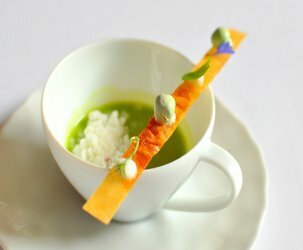 Looks awesome, especially if the vendor gives a generous plate of herbs. His frying is clean too! It looks spotless and brand new! 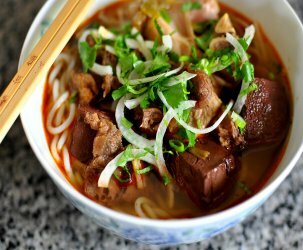 Wandering Chopsticks – Oooh, banh khot! I hope you think of the location because I have yet to try that dish. And thanks for the bun cha and cha gio rec, I can’t resist a killer cha gio! tanglethis – I didn’t even realize the shrimp still had its eyes until I saw the pictures! White On Rice Couple – all the herbs and greens you can eat! And you’re right, the oil is quite clean! It was mispelled. It should be bánh cống not cóng but some southern vietnamese pronunciation is lazy to enunciate the ô. 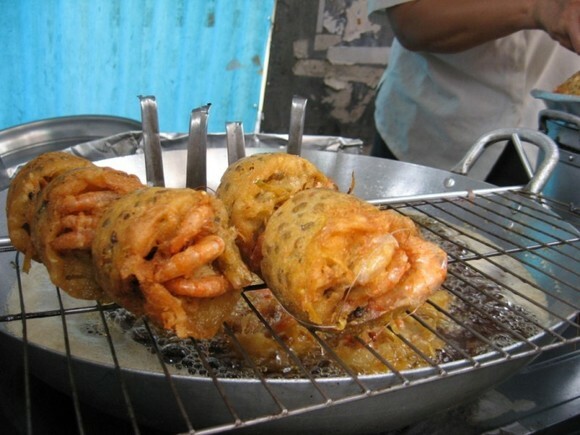 Can you me how to make this Banh Cong ?